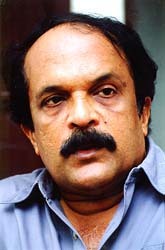 Paul Zacharia is one of Kerala's best known writers. His stories are pathbreaking and unconventional, so also his political commentary. His political columns always end in some controversy or the other. His non-conformist and unorthodox ideas set him apart from other creative writers and political commentators in Kerala. In this no holds barred conversation with Shobha Warrier, the novelist discusses the BJP, the Left, Muslims, the Nehrus, the Gandhis, and what has gone wrong for India these last 50 years. When did your realise that you lived in free India? I don't know whether I ever realised that. Yes, there was a time I used to think that I was living in free India. That was the time when you were young and in school; that was the time you were taught the national anthem and that was the time we were taught that Rajiv Gandhi and Sanjay Gandhi were Nehru's grandchildren. But then as you grow up and become politically alert, you realise that perhaps India isn't there. That it was just a Gandhian dream. Secondly, freedom is a highly relative term. It is actually freedom for some and not for all. Apparently even today people are talking about freedom from the British. That we won freedom from the British doesn't mean a damn thing to me. I think freedom means a lot of other things; it means justice, it means an end to poverty and three square meals a day. It means the freedom for a woman to walk alone on the streets at night, it means the freedom to educate your children. Merely because a set of white administrators have gone away and another set of similar administrators have come back does not mean that we are free. Does that mean it would not have made any difference to you if you were ruled by the British or Indians? I suppose there would have been a difference because we don't relate to the British culturally, though many Indians do because of English education. Even the BJP-wallahs are more British than what they think they are. It certainly makes a difference whether they are messing up or we ourselves are messing up. If we are messing things up, it gives us greater pleasure and it gives a greater sense of the freedom to mess up. But some people say it doesn't make any difference to them whether they are looted by the British or by Indian politicians. After all, looting is looting and messing up is messing up. That way, yes, it really makes no difference. Perhaps the British would have provided better administration; certainly a more impartial, more organised and management-oriented administrative system that what our present babujis are providing us. So, for the poor people it really wouldn't have mattered. But freedom from foreign rule is a long term question. In the end, if you are fast enough like Indonesia or some other countries, you will be able to reap the benefits of freedom quickly. If you are a lethargic and backward nation like India, the process will go on for another two centuries. What is the reason for our backwardness? Like you say, is it because of our lethargy? Or is it because our rulers are more self-centered? I can't say. I personally feel the concept and character of the nation has been superimposed on us in a misguided way which itself can be very damaging. For example, people talk about a 5,000 year-old history of Hindustan, 800 year-old history of the Mughal empire, etc. as part of the Indian tradition we inherited. All this happened, after Nehru's very good but foolish book, Discovery of India. Frankly, living in Kerala, I have nothing to do with this 5,000 year-old history, I have nothing to do with this 800-year-old Mughal tradition and I have not been affected by it at all. I am not beholden to these traditions for any day. In a nightmare I see the Indian nation as a robot created and set in motion by the British and installed with a beautiful dream- software made by Gandhi. What was Gandhi's idea? Was he, in true Indian tradition, just a godman who adventured into politics and messed it up us usual? Or was he the bearer of an idea whose time had not yet come? It seems to me that only he held the key to the important questions raised by Indian nationhood. Only the stapathi knows the flaws of the moorthi. Discovery of India was the secondary software which provides the robot its creative neurosis -- the illusion of a grand and single self; something like Advaita. And now the virus is Hindutva. Because he was a good man, Gandhiji imagined that everybody would be like him: patriotic and unselfish. So he dreamt of a nation partly because there was no nation. When he was asking for freedom, whose freedom was he asking for? There was no India. There was only a set of kingdoms and some British-ruled administrative units. So, he had to first of all create an India and then say that this India wanted freedom. His thinking went into creating a nation which according to him was an ideal India, swarajya, Hindu swarajya or Ram Rajya or whatever. This had validity as far as fighting for freedom was concerned. Afterwards, another set of realities came in. Poor Gandhi, in one sense, did his job by using this national concept to bargain with the British. But as soon as freedom came, the nation went to pieces. Freedom is a long term idea. If we had obtained freedom 200 years ago, perhaps by now even with all our lethargy, we would have been a prosperous nation or a prosperous group of nations in the sub continent. Is fifty years such a short period to be prosperous? In fifty years, many people have created miracles. But we are not able to. Colonialism has somehow taken away a certain sense of initiative because we have been a subject people for a long time, directly and indirectly. Now everybody looks to the government to solve all their problems and regards it as a milch cow. Sense of impending poverty: poverty round the corner, behind your house waiting to catch you makes everyone very selfish. This is a grab-as-much-as-you-can kind of psychology. Why isn't anybody working for a stronger and more prosperous nation that Gandhi spoke of because there really is no nation. Yes. The Indian citizen is not committed to a nation except when they have a stupid cricket match with Pakistan. You also talk about a nation when you have a war with China. Rest of the time, each Indian citizen is tied to himself. That is why I said, the concept of nationhood is fundamentally flawed somewhere. The ideas that drove Malayalis to embrace the new nation are not the same as those that drove the Bengalis or the Telugus or the Marathas. Each subnational dream was different. Now these individual desires are stirring. This is the great Indian subconscious. But we have no Sigmund Freud to monitor it. Only the mindless paramilitary forces. Blame Gandhi for Mother India and our Oedipus complex. He was the first victim of course.